Vanity metrics are easy to measure and look good on the surface but don’t have substance because they’re easily manipulated or don’t indicate real business success. Examples of some common vanity metrics include Twitter followers, traffic to your website, ad impressions, and email opens. These numbers don’t matter to decision makers because businesses don’t make money from how many people visit their website or see a Facebook ad – they make money off customers! When mapping out which data points to measure for a successful marketing strategy, it’s important to ask the right questions. Take this scenario: a client recently asked, “My website traffic has been decreasing over the year since I started working with you. What’s wrong with our marketing?” As you can see from the Google Analytics screenshot, he was right – traffic steadily decreased over the last year. 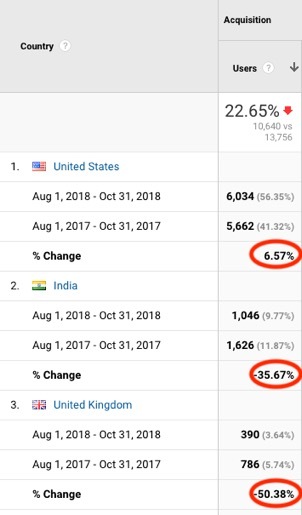 We then looked at website traffic during our August to October 2018 marketing campaign, compared it to the same period in 2017, and found that US traffic increased almost 7% while traffic from India decreased 35% and traffic from the UK decreased 50%. The drop in international traffic was the drop we were seeing in the traffic reports and was positive because with less traffic coming from outside the US, their salesperson had more time to follow up with viable leads rather than sift through unqualified leads. Before you erase these vanity metrics from your reporting, however, you and your marketing team must clearly define your business goals and the data points you’ll measure to achieve them. A quick shortcut is to ask, “What business decision can we make with the metric?” Getting caught up asking the wrong questions can lead to stagnant, ineffective marketing. Need help choosing the right metrics for your marketing strategy? Call or email us!